The herpes family of viruses are responsible for some common infections in people. Herpes zoster is the virus responsible for chicken pox and shingles. Herpes simplex is responsible for recurrent infections of the skin and eyes. The two types of Herpes simplex virus have different pathogenic effects; Herpes simplex type 1 causes cold sores. The virus stays in the body, which means once you have had a cold sore, you are liable to get one again in the future. Triggers that release the virus from the nerve back into the skin include stress, being run down and being out in the cold. The lower temperatures causes trauma to the skin, which is enough to set the virus off again. This virus can also do a similar thing in the eye and is the main cause of herpetic eye infections. Herpes type 2 is the virus that causes genital herpes – it rarely infects the eye or causes cold sores. When this virus infects the eye, it only multiplies in the surface layer of cells, in the cornea. This is the see-through window that allows light to pass easily through the pupil and to the retina, to allow images to be processed by the brain. When the cornea is infected, it leads to a condition known as keratitis, which can be painful. It causes the eye to feel gritty and to look red and raw. Blinking can be painful and the eye can feel dry, even though it may water profusely. It is also common to feel uncomfortable in bright light – a condition known medically as photophobia. Having a Herpes eye infection usually makes your vision very blurred – and it can cause the eye to feel painful, causing a generalised headache. There are two types of keratitis. Herpes simplex infection in the outermost layer of cells is usually referred to as epithelial keratitis. If the infection goes deeper into the cornea, stromal keratitis can develop. Around 0.2 per cent of people are prone to this type of Herpes infection but they do not usually start to experience recurrent eye infections until their 30s. When the eye of someone who is infected with the Herpes type 1 virus is examined closely with a magnifying glass, an ulcer of active viral infection may be visible. This is a key diagnostic sign. Viral infections are very difficult to treat. The human body becomes resistant to them quite quickly in most cases of herpes eye infections. 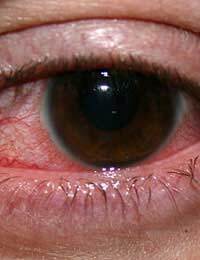 To try to reduce the symptoms and discomfort, epithelial keratitis can be treated with eye drops containing acyclovir or ganciclovir. These antiviral agents prevent the virus from multiplying quite so efficiently within the eye tissue, and give the immune system a chance to beat the virus more quickly. If the infection has spread to the deeper layers of the eye, it may be necessary to add in some steroid eye drops to the treatment. Treating the eye with steroids is a delicate business and it is up to the judgement of an eye specialist to decide whether this treatment will be beneficial or not. Although eye infections due to Herpes simplex clear up fairly quickly, repeated infections can cause the cornea to become scarred, which can affect vision. It is important that each new eye infection is treated very promptly to minimise the impact on the cornea. In people whose infections happen often and are very severe, a corneal transplant may be necessary to allow them to keep their eyesight. My wife had mild sensationary viral infection on left side of the face.it healed but her vision remained little blurred.Optically she is found ok and Neurological investigation on MRI did not reveal any adverse effect.ERG is also found normal,as she is NAGlaucoma patient operated in BEs before 5years.Do you expect any herpes in eyes to create any damage in her vision?what precaution would you like to advise?